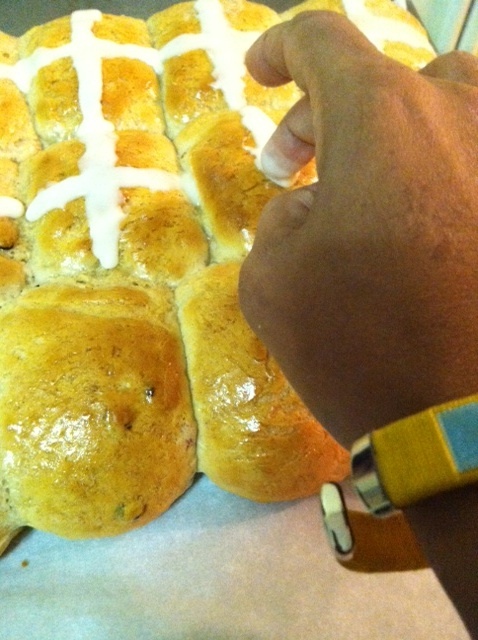 Putting the final touch on my freshly made hot cross buns. There was a time when I could not reflect on my childhood Easter celebrations in Barbados without getting the chills. Of course, there are many joyful memories too. Still, there’s a specific recollection of an Easter tradition in the Caribbean that is beyond spooky. As a little girl, my Sundays were spent at church and while I don’t recall the exact age at which I first heard about The Passion of the Christ, I know that for many years whenever Easter came around, I cried when the story was retold. It was hard to fathom such suffering. Obedient to my Sunday school lessons, I accepted from early on, that I had to be very special for someone to die for me. Bajans like to boast that we have a church on almost every corner and given our predominantly Christian nation, Easter is indeed a most hallowed occasion. As thousands of congregants are reminded of the crucifixion, we traditionally adhere to certain observances like not going go the beach on Good Friday (due to a belief of higher chances of drowning); avoiding meat on the day, eating fish instead; wearing black to Good Friday service and white to church on Easter Sunday; and kite flying for both children and adults. But, clearly, those aren’t the things that evoked fear in me. To this day, I don’t know what is, or if there’s a title for the particular custom, but it involved eggs and not for any culinary treat. Back then to pacify myself, I would indulge in an actual culinary delight synonymous with Easter – my mother’s hot cross buns. Since moving to New York, I have maintained most of the Easter traditions from back home. I, however, can’t boast of flying any kites here and I definitely never did that thing with the egg. Yes, that thing with the egg that used to scare me. Every Good Friday morning when I was a child, my mother or one of my uncles would break an egg into a glass bowl or a glass filled with water. Then they would place that bowl or glass out in the yard, leaving it in the sun until noon. Once the time came, everyone in the family would be gathered and we’d all go and see what the egg had “predicted.” It was believed that during the time the egg was left in the sun, it was forming an image. This image would be symbolic of an impending occurrence in the family. For example: if the egg showed what looked to be a fetus, a relative would soon get pregnant; an image of a ring meant someone was going to get married; a ship was interpreted as someone embarking on a trip/traveling and a coffin indicated death. I don’t know if it was a mere coincidence or if that egg was just incredibly accurate, because on more than one occasion when we saw a ship, family members migrated a few months later. That time we saw a ring, one of my uncles got married by the next year. But what left me with that eerie feeling was twice when we saw the coffin and each time one of my great-grandmothers died. I began to dread that Easter egg thing. I was relieved that as the years went by and my relatives started scattering further across Barbados or the region, my mom stopped doing that egg thing. By then, her baking business was thriving, so hot cross buns played a bigger part in our Easter celebrations. Tears welled in my eyes as I neared the Altar of the Crucifixion. On reaching there, I knelt in prayer and gave thanks to Him who sacrificed to save me. I descended the stairs and paused to lay my hands on the Stone of the Anointing, the area where it is said the body of Jesus was prepared for burial. Further overcome with emotion, I slowly made my way to The Aedicule (the Tomb of Christ). I then joined hundreds of Christians there and lit a candle in tribute to the Resurrection of Jesus. Today, that magical memory within the Old City Wall of Jerusalem outshines any silly scary egg “wonders” of my youth. And as I take my freshly baked homemade hot cross buns out of the oven, I delight not only in this tasty traditional Caribbean Easter treat, but in The Cross. Happy Easter. Thanks for the reminder S! I meant to add the rhyme, but it was taking up to much space in the caption area lol! Save one for moi! They look soo good. 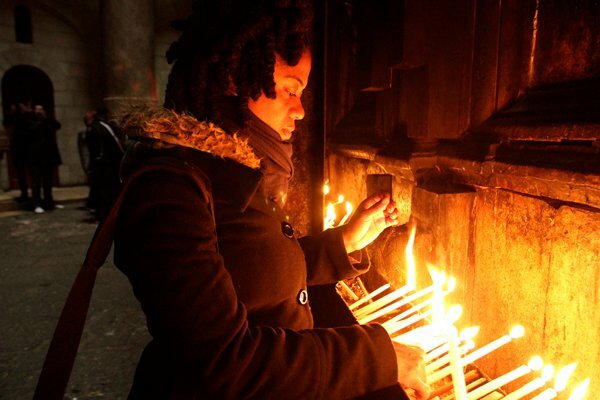 As Christians across the world commemorate Passion Week, and we prepare to celebrate the resurrection of Jesus come Easter Sunday, I thought it fitting to reblog this piece sharing my reflections of Easter in the Caribbean. . . and more.